The Great Basin College Theatre Program will hold auditions for Stephen Sondheim and Larry Gelbart’s comedy romp, A Funny Thing Happened On the Way to the Forum, Tuesday and Wednesday, January 9 and 10 at 7 PM in the GBC Theatre. The story centers around Psuedolus, a crafty slave trying to earn his freedom by securing the hand of the beautiful (but slow-witted) Philia for his master, Hero. Cases of mistaken identity, door slamming and a show girl or two round out this Broadway comedy classic. Interested actors should prepare a minute of two from a Broadway show to present. An accompanist will be available to play, or actors can bring their own tracks to sing from. A cappella auditions are discouraged. Actors should come dressed to move as well. The production dates are March 20 through 24. Rehearsals will begin January 11. Rehearsals will be held in the evenings. 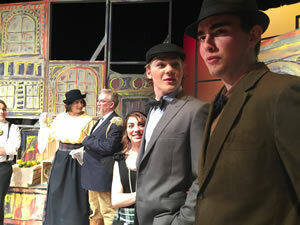 Actors must be at least juniors in high school in order to audition. Actors not enrolled as GBC students will have the opportunity to earn college credit for participating, or can enroll in the GBC Theatre Continuing Education Course. The production is directed by John Patrick Rice, with music direction by Walt Lovell, vocal direction by Gail Mierins, and choreography by Rebecca Kufeld. For more information, contact Rice at 753-2240 or john.rice@gbcnv.edu.